On Friday I presented this session at the Forward Government Learning conference, on the topic “The Future of the LMS in the Public Sector”. It can be difficult to make meaning from slides alone, so here is some of the thinking and context behind these ideas. It wasn’t a topic I chose directly (I don’t find LMSs in and of themselves particularly inspiring…and “LMS” and “Public Sector” together in one sentence even less so). However, as I started thinking about what I could possibly say that wouldn’t put people to sleep (especially on a Friday afternoon…), I started seeing some potentially interesting angles. I wasn’t interested in looking at the capabilities of the LMS as a system from a technical perspective, so much as the drivers for change in how LMSs are viewed and used – and what this means for people. My initial thoughts were influenced by my own observations and experiences in the organisation I work for (Transport for NSW, a large state government agency responsible for the operation of public transport services – rail, buses, roads & maritime). During my (relatively short) time in the public sector, I’ve seen reforms like consolidation of agencies, moves toward shared services, and the increasing prevalence of holistic workplace learning models like 70:20:10 – all of which has an impact what we do in Organisational Development (OD), and the systems that we use (in OD/L&D, primarily the LMS). Interested in other people’s views, I also put out a call on twitter to (ex)-Government peeps in my PLN (which I’ve Storified here), and collected ideas and examples from others in Transport OD. I am grateful to Con Sotidis and Vanessa North from my PLN who provided their thoughts; and Martin Caldwell and Helen Fullarton at Transport OD who gave me information and examples of portfolios of evidence and competency assessment initiatives they are involved in implementing. Shared services > shared systems – this is essentially a comment on the public sector trend towards consolidation of agencies and centralisation of services (L&D/OD/HR/Payroll/Procurement), and how this is driving the consolidation of systems (like LMSs). I’m interested in how this subsequently impacts people-process-workflow-behaviour…and potentially values – particularly when applied to the L&D/OD space. And additionally, what this might mean if / when this sharing & collaboration happens across different government agencies. Integrated systems > seamless employee experiences – within organisations (certainly mine) there seems to be a move towards integration of people systems (LMS/HR/Payroll/Performance Management/Devt). (A few government delegates at the conference mentioned the same was happening in their organisations). I’m interested in how this changes (improves) the employee experience – especially experiences like recruitment and induction. Ultimately (once the implementation issues are ironed out…) it should lead to much more seamless employee experiences than is currently the case. There’s a much greater recognition of the limitations of the LMS for supporting the 70 and 20 components (e.g. performance support, coaching, mentoring), and appreciation that often, there is little or no value in tracking these activities in an LMS (particularly if ‘completion’ and ‘score’ is the only data that can be reported on). Subsequently there is increasing use of more dynamic, accessible and flexible platforms like the intranet, sharepoint, portals and mobile apps to support on-the-job, just-in-time workplace learning. Use of portfolios of evidence to collect a broad range of authentic and meaningful artifacts to demonstrate competency in actual task / job performance (vs ‘content completion’ or ‘score’), and also to promote more reflective practice. Greater blending of comms and learning – especially to support broad based organisational change initiatives. In Transport, our internal comms team is actually part of OD. This is leading to a more integrated and aligned messaging, and enabling more ‘campaign’-based approaches to supporting organisational change. Beyond SCORM and completion tracking > xAPI for more meaningful and integrated data – although xAPI (“tin can”) is still very much in an experimental phase, I don’t think any conversation about the “future of” LMSs can exclude mention of it. 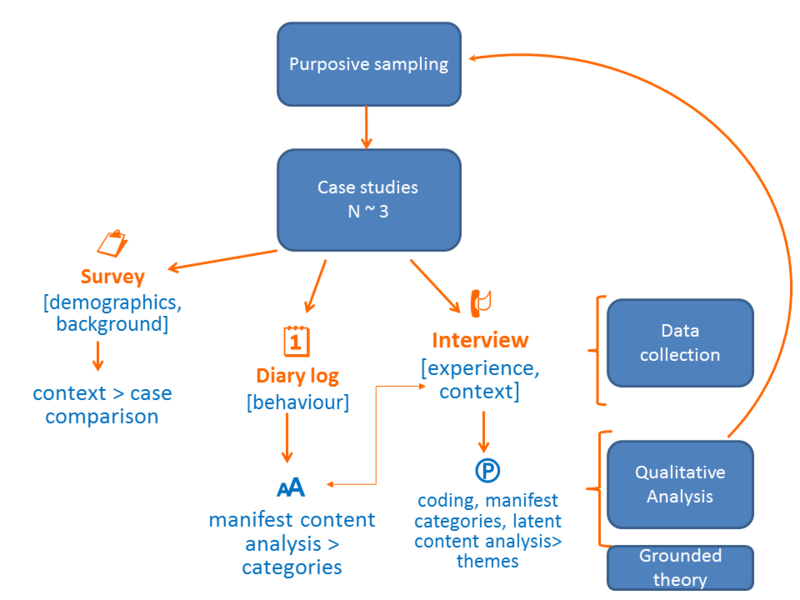 Here, I was interested in exploring conceptually how it could be used to ultimately help people to work better and improve performance – by gathering and using more meaningful data about how people work and learn – and developing tighter feedback loops between the two to inform training interventions (as one potential use for xAPI in the L&D/OD context). *NOTE: a comment from a delegate at the conference mentioned LTI (Learning Tools Interoperability) as an alternative to xAPI for achieving similar outcomes. Sounds like something worth looking into. Whilst there wasn’t quite as much discussion as I’d hoped from the session (last up on a Friday afternoon is not exactly the time to get a conversation going…), keen to hear any thoughts and perhaps start (or continue) a conversation here or elsewhere. Get in touch. Preface: this is a post I wrote back in March-April 2015 but hadn’t published as I’d wanted to create a more readable version of the diagram (yes. It took THAT long. Mainly because, as is often the case with draft / unpublished posts, I forgot about it then lost the momentum / motivation to go back to it). I’m digging into the blog draft archives and posting them without significant editing to try to develop a ‘WorkOutLoud’ attitude and become more comfortable with publicly sharing work-in-progress. I’ve been thinking a lot about conversation spaces lately: public and private; online and offline; formal and informal places and spaces, and how each of these might support various ways of knowing and learning. The seed of this thinking was planted by Kandy Woodfield’s excellent and thought provoking post last year on the ethics of (open) social learning and working out loud. Kandy’s post prompted me to start considering the role, pros/cons, and differences of open, public, professional learning spaces vs closed, private, personal ones – and how our learning across these contexts interact to influence our identity, connections, conversations, mindset and behaviour. This thinking has been kick-started again as I’ve reflected on recent ongoing private conversations with a friend. This is a person I have only known for about 6 months, who less than 3 months ago I’d have called an acquaintance. The (what feels like) accelerated status from acquaintance to friend has occurred largely through these private conversations, in which we’ve explored complex topics at a personal level, through a variety of mediums: in-person conversations, text messages, email, phone calls. These conversations have been open, honest, challenging and confusing, where I’ve learnt as much about myself as I have about my friend; that have challenged me to think about things that I otherwise wouldn’t have (or wanted to); and inspired and supported me to change the way I approach certain situations. It’s a personal learning experience that feels something like therapy, counselling, or coaching conversations – but without the formality or power dynamics inherent in these contexts. John Stepper’s WOL circles (based on Sheryl Sandberg’s ‘Lean in’ circles) – an informal model for peer coaching and support might be an apt comparison. But yet more emergent, organic (serendipitous?) – without the guidelines, explicitly articulated purpose, or group dynamic. As learning practitioners and educators we often ponder how to achieve deep, personally meaningful learning that inspires and supports ongoing, long term behaviour change. The type of learning that – in an organisational context – translates not only to impacts on business measures, but broad and lasting cultural change. That in an educational context – might lead to a breakthrough transition: from uncooperative/disruptive students with low self esteem to enthusiastic students proud of their achievements with a newfound thirst for learning (This inspiring EdContexts post by Éllen Cintra is a great example). The type of learning that prompts individuals to examine within, reflect deeply, question long held beliefs, and change their behaviour or habits. My instinct is that all of these learning experiences come about through similar underlying processes. I have been wondering about the characteristics of this type of profound learning: how it emerges, whether it could be achieved in an intentionally designed environment, and the conditions that are needed to facilitate it. And what I’m thinking might drive this type of learning is conversation. Conversations of: openness. honesty. empathy, shared understanding. shared purpose, trust. Vulnerability. Acceptance. Mutual, ongoing support. Conversations that make you FEEL deeply as well as think deeply. That engender emotional, as well as cognitive connection. It may not be so much about finding a solution to a defined problem, as it is about uncovering, unravelling, & exploring complexity and supporting each other to figure out how and what might work. Can environments be ‘designed’ to support this type of learning? ‘Design’ in this context is not about developing the right set of ‘learning resources’. It’s not about setting up an ESN (Enterprise Social Network) and hoping for the best – or manufacturing reasons for people to ‘interact’. It’s about creating the right type of ‘conversation space’ for these personally or professionally meaningful conversations (and learning > relationships > behaviour change) to emerge. Private or semi-private (e.g. a closed group) conversation spaces. High degrees of trust and vulnerability are critical for deep learning. This may be difficult (impossible?) to achieve in an open, public space. Personal conversations, private/direct/text messages, coaching or performance conversations, journals, WOL circles are all examples of private conversation spaces. In-person contact – maybe it’s possible to develop the same level of trust and vulnerability exclusively through online interactions, but I’m still not entirely sure (reflecting on this conversation on Terry Elliot’s blog re the nature of connection). At the least, it might take longer and be more difficult than if there were opportunities for face to face contact. More ‘present’ forms of online interaction like Google Hangouts, Skype or video calls might help bridge the gap. Regular, ongoing contact, ‘check-ins’ – this may be essential for the ‘change’ aspect of this learning – ongoing, mutual support, talking through issues, encouragement to try (and keep trying) different courses of action, following up and reflecting on what seems to work (or not) is a form of social accountability, and helps motivate, kickstart & continue behaviour change. Empathy / shared experiences and/or purpose – empathy can be so important for developing trust. Maybe because when empathy is present there is no judgement. Empathy might come from shared experiences and/or a shared purpose. Or might simply emerge from listening without judgement. 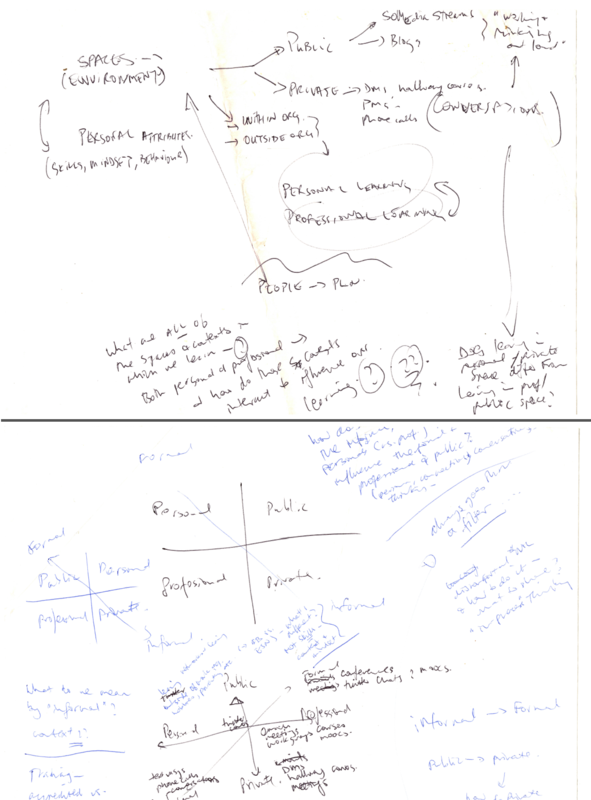 This is something I drafted a couple of months ago, to start mapping out some of this thinking. I always intended to post it as a ‘thinking out loud’ artifact, but wasn’t inspired to write the framing post and backstory for it until my personal conversations with my friend, and the conversation on Terry’s blog got me revisiting this thinking. (Thanks Terry – and thanks to my friend who has been integral to the backstory. I think you might know who you are). Well…#wolweek (“working out loud” week) didn’t quite turn out as I’d anticipated, when I optimistically wrote a post last week about intending to participate. Day 1-2 I was mostly offline, madly finishing a work piece to support a huge organisation-wide ERP project. Not quite sure what happened the rest of the week…but I never managed the flurry of tweets and blog posts of updates on work in progress and half baked thoughts I’d imagined at the week’s beginning. I was reflecting on why this was the case, and I think it comes down to the simple fact that it takes more than just intentions to change behaviour. Although I had the intention to participate, I didn’t actually think about how I’d do it. Starting a #wol habit and participating actively in #wolweek involves actively participating in a community. This starts with consciously and habitually checking the feed, responding to other’s updates as well as sharing your own – and integrating this behaviour into your work day. This is the challenge of any new behaviour change. As Jeff Merrell pointed out on my previous post, #wol isn’t just about sharing publicly, but sharing and being open with anyone you’re working with. Yes, I was in ongoing communication and shared work in progress with stakeholders in the project (something I am consciously working on getting more comfortable with – and have found that early sharing of incomplete work or initial ideas- can be very helpful). But – were there also moments when sharing what I was working on with the broader network outside of my immediate work group could have helped me? Definitely. trying to figure out how to link internally to a set of html files from a page in an elearning authoring tool. Googling it brought up a number of promising looking links – but they were all to the vendor’s (CLOSED) community. When I tried joining the community to access the forum posts, the activation email didn’t work. I gave up, and eventually called the vendor’s support where I eventually got the information I needed to make it work. It was a frustrating experience that could possibly have been short circuited by directly consulting my network. Did I even think of this at the time? No. (This goes back to not having thought about the sorts of things I’d share during #wolweek, and when). toying with the idea of a structural change to the online comms/awareness piece I was working on. I ended up leaving it in the end but at that point when you’ve looked at something 1000 times and lost all objectivity, getting feedback from someone with no background or prior knowledge can be helpful. So…although #wolweek is just about over, and didn’t go quite as I’d intended, I’m hoping my reflections on why, how and what i could have done will help keep #wol front of mind for me, and trigger a response to share what I’m working on and learn from others. And at least I’m getting more comfortable with blurting out quick posts. I’ve also got a bunch of old drafts that I will publish…likely over the next week (as it’s after midnight now and I don’t have the energy to do anything other than post this one!). I met with my supervisor a couple of weeks ago to get feedback on my research proposal. One of the most helpful suggestions he made was to tease out the factors from the literature that influence the usefulness of a network to achieve the desired outcome (i.e. improvements / innovations in professional practice) – and to develop a model based on this literature review. My research could then be used to explore / validate this model (and provide some structure to interviews and data analysis). So this is what I’ve been working on. Aside from the benefits this model will bring to structuring the research, the process of thinking in terms of a model has been extremely useful in helping me to consolidate the various (and disparate) strands of literature I’ve reviewed, and my thinking around it. This is my working draft. Environment – a lot of research focuses on the ‘tools’ / tech that people use to build and develop networks. Whilst this is certainly interesting – as different tools have different affordances which support varying aspects of PLN relationship development – it’s more than just the discrete tools and tech that influence the development of these relationships. It’s the entire context in which the tools / tech are embedded and used – this includes the environmental & situational context (e.g. where is the tool/tech being used – work, home, the beach, etc? ), culture (incl. organisational/industry/societal/geographical/national/political etc), and the support available to develop skills in the use of the tools/tech. Personal – these are the personal skills and characteristics that contribute to an individual’s decision and motivation to actively and intentionally build and maintain a PLN. Significantly, this includes both networking ‘skills’, as well as attitude / mindset, and reflective behaviours. People – this I’ve classified as the ‘network’ characteristics that make up an individual’s PLN, consolidating the body of research on network structure (strong vs weak ties; open/closed networks, network diversity etc). A lot of this research comes from the management / R&D literature and so often focuses on identifying links between these network components and outcomes like innovation and creativity. Of course, there are interactions and complex links between all three components, which is what I’ve tried to portray in the the model. I see these three components as impacting both the processes of learning and outcomes. The outcome of interest I’m defining primarily as innovation in professional practice – but mindset and behaviour, both of which contribute to the outcome (output?) of ‘innovative practice’ could also be considered outcomes (which could be explored through interviews). How does this model link in with existing PLN models? 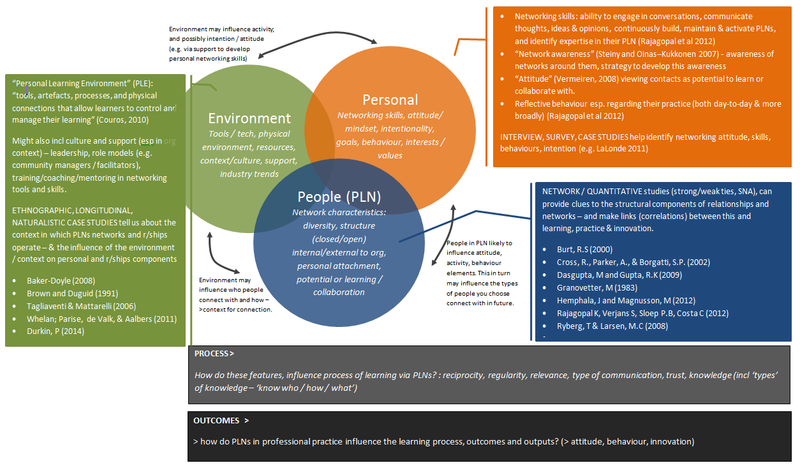 For me, this model demonstrates the importance of the personal skills, attitude and behaviours required to develop an effective PLN; and the factors which influence intentionality (why and who people choose to connect with). It also touches on the role of tools / tech for supporting the behaviours (‘Activity’) and ‘skill’ components (fig 3). But what’s missing I think is the broader context related to environment (it’s not just tools / tech) and network / people characteristics that may impact on these personal skills, attitude and behaviours. Thus my attempt to incorporate these components into my model. 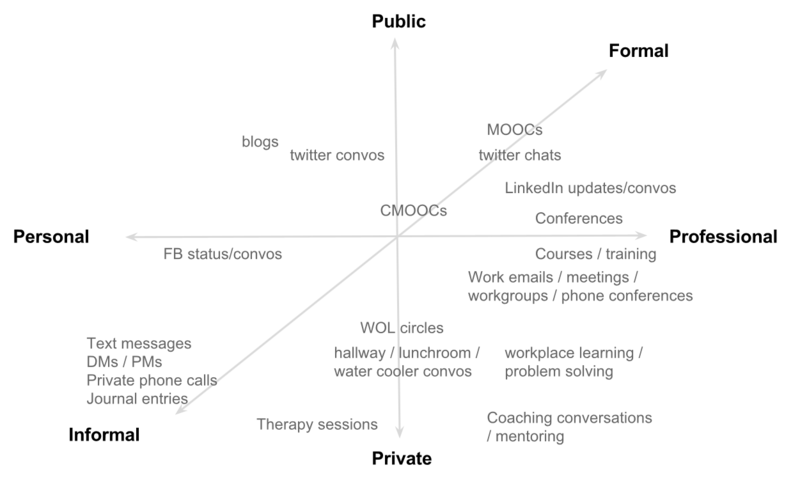 Personal Learning Networks: Learning in a Connected World by Sahana Chattopadhyay (@sahana2802) which I first encountered on LinkedIn, but also published on her blog (accompanied by an excellent discussion #MSLOC430 related thread). Aside from it being a well written, comprehensive argument on the benefits of building PLNs to support the changing nature of work, what struck me was the emphasis on mindset and attitude – not just tools – as critical in effective social learning and collaboration (reflecting Rajagopal et al’s model above). My Professional Network Review by Michelle Ockers (@MichelleOckers) – this detailed analysis of her PLN blew me away when I saw it. This post for me, represents a perfect example of the attitude, intentional activity (including reflective behaviour) and skills that Rajagopal et al (2012) describe in their model for building, maintaining and activating PLNs. I’ll continue to tweak and share my evolving thinking on this as it progresses. Commenting on my post, Nick Leffler @technkl shared his experiences and struggles during his own MA research, and also linked me to his research project (which was the first I’d learnt he’d done a research Masters too). Doing research for the first time is no easy task, and talking to someone who’s been through it before and can empathise with the trials and tribulations can really help. Tania Sheko (@taniatorikova) shared her experiences (challenges & frustrations) of not having informal learning and professional development from her PLN recognised at the school she works at – helping me realise that schools and organisations are probably more similar than they are different. And…ever since I met her (through #rhizo14) Toni Rose Pinero (@moocresearch) and I have had ongoing conversations about our respective research Masters projects. Posting my proposal helped reignite the conversation and we’ve been checking in with each other more regularly this year to provide mutual support. This type of support I see as building the “structural embeddedness” (who knows what) and “relational embeddedness” (social climate of trust and reciprocity) – two of the three components that Van Den Hooff et al 2010 identified as necessary for a network to make a positive contribution to (workplace) performance. I got some great constructive feedback from Ryan Tracey (@ryantracey) including suggestions for refining the research design and proposal. Ryan also sent me an extremely relevant article “Secret Power Brokers – The ties that bind our workplace” – a study on how several large Australian organisations are using social network maps to identify hitherto hidden ‘power brokers’: extremely well connected employees who hold a lot of influence within the organisation through their (informal) role as trusted advisors, key opinion makers and change agents. Often these critical people are unknown to management, as their influence resides in the informal employee networks that develop through the flow of work rather than the the formal structures represented on the org chart. It reminded me very much of the study by Whelan et al (2011) Creating employee networks that deliver open innovation, which forms a critical base for my own research, and had similar findings to the article Ryan sent me. @tanyalau After all, how does one know “which trash to throw out”? If you had a #PLN ROI model then the task would be automated – yes?? Whilst I wasn’t entirely convinced of the concept, it definitely got me thinking about how such a thing might or might not work – and why. The twitter conversation got us both thinking. The next day, Con wrote a LinkedIn post on the value of PLNs, where we continued to exchange thoughts on this – how one determines the ‘value’ of their PLN – who to connect with, who to filter out, how and what we share with our PLNs. Thinking out loud in the comments on Con’s post helped me develop my thinking on this…as did Helen’s blog post on ‘exploring innovations in networked work & learning’ (the open ‘course’ / section of msloc430 that Jeff Merrell is running at the moment). I’ve been thinking about this a lot more since and think it might come down to alignment in values – between the individual and the organisation. I don’t think an organisation will ever be able to ask an individual to ‘utilise’ their PLN purely for organisational benefit: this will only happen IF the individual wants to. An individual will only ever WANT to build and leverage their PLN to support organisational goals if they are inherently engaged in what they do, and want to improve what they do at work (i.e. if they’re intrinsically motivated). And they will only ever WANT to do this, if their personal values are aligned with the organisation’s. Through these conversations, I’m coming to the conclusion that the key to an individual leveraging the expertise of their PLN to meet organisational goals will result not from a ‘top down’ implementation / demand from leaders or the organisation that they do so (or even good role modelling of the behaviour from said leaders)…but from an alignment of values between the individual and the organisation. This could be a thread worth exploring further…a thread I may not have realised had it not been for sharing and connecting with my PLN on my research proposal.